"Eight miles outside of Springdale lies a charming little town called St. Patrick's. With rolling, grass covered hills and a deep, blue, sheltered bay, it is reminiscent of an Irish fishing village. This similarity might not be entirely coincidental, since most of the settlers are of Irish-Catholic origin. The main family names were Gillard, Hayes, Delaney Mercer, Bouzane, Joy and Cleary. 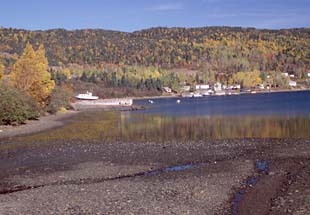 Originally Little Bay, the community of St. Patrick's was named by Reverend Steven O'Flynn in the early 20th century. St. Patrick's was first settled approximately 120 years ago. 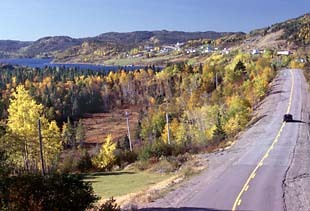 Most people put down roots here in order to be close to the mine that was in operation at Little Bay. 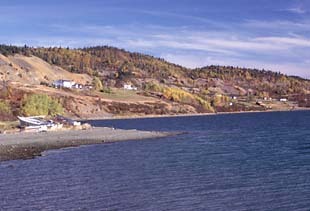 Some residents also worked in the lumber woods, while others fished for H.L. Strong Ltd. on the French Shore. William Joy and Richard Bouzane carried the mail for St. Patrick's in the early 1900's. They picked up the mail as far east as Benton, and as far west as Deer Lake. They carried this mail for miles on their backs. Since the town required a mail carrier, it must have had a population of at least 100 at the time. In 1904 the fire that ravaged Green Bay destroyed the quaint community. Every house was obliterated, except for that of the fishing captain, John Delaney. He instructed his wife to keep their home watered down as protection against the blaze. A steamer took everyone else out of the immediate area. Still, there are remains of the Delaney house in St. Patrick's; not in the form of a run down building, but beams and lumber from the house are in use in Leo Hayes' home..."